Garage door repair in Austin is the most sought after at Action Garage Door. Our years of experience and high-quality work make us the garage door service in Austin that you will come to love. When you want the best in garage door repair and other services, you have to turn to the best. For years, we have been providing residents all over Austin with the garage door service they need to have their garages in the best working order. 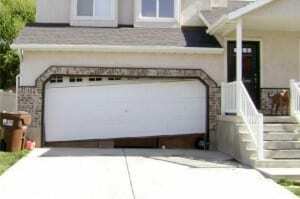 If your garage door falls off its track, we’ll be there. But we won’t laugh when you tell us that it’s the scraping and squeaking that’s driving you crazy. Action service technicians can adjust the safety sensors, balance the springs, replace a snapped cable, repair a heavy-duty hinge or install a new electric opener – it’s all in a day’s work for our team. When you need garage door service or repair, there is only one company to call. Action Garage Door has your back, so to speak, no matter what the problem with a garage door. We are equipped to handle emergencies as well as routine adjustments, and we schedule our services on your terms, responding to residential or commercial needs. We understand the need for immediate service and respond within an hour if necessary. We also respect your time constraints and set priority appointments that work for your personal schedule. As a garage door repair company that is committed to customer satisfaction, nobody beats Action Garage Door. Our family-owned business has been satisfying customers for 30 years and we are waiting to help you find the services you need for your garage door in Austin. At Action Garage Door, we understand you have many needs when it comes to garage door service. For this reason, our garage door service goes way beyond simple repairs. Some of our services include residential and commercial garage door installation, and garage door maintenance. No two home or business owners are alike, and our garage door repair company understands that no two will want the exact same garage doors and set up. We offer a variety of garage doors for installation in Austin homes and offices. Some of our options include Carriage House, Olympus, Classica, Stratford/Heritage, and Amarr garage doors. We have hundreds of styles to choose from in both steel and wood. We believe it should be a breeze finding a door that matches your needs, budget, and style choices. We are also there for you when it’s time to build a new home or beautify the street view on your existing abode. Why not keep our number handy so that no minor annoyance will detract from the great experience of living in Austin? Live music (and Willie Nelson) and line dancing, craft beer, “trailer food,” bats under the bridge, rafting on the San Marcos River, the state capitol and UT. In no particular order. Those are the things that most people associate with the capital of Texas. But there are innumerable other things that attract residents to the eleventh-largest city in the country in the second-largest state. And there’s one thing that everyone hates, and still puts up with — the abominable traffic! But this city of just under a million people is the center of an expanding metropolitan area, the fastest-growing city with a population over 50,000 in the entire United States. The Austin area that includes its suburbs has a population of more than two million. The growth, both with the city limits and beyond, shows no immediate signs of slowing. 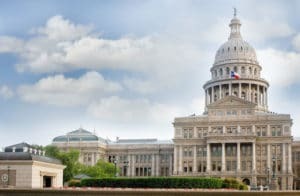 Austin is located at the edge of what is known as the Texas Hill Country, situated on Interstate 35 a little over an hour north of San Antonio and about three hours south of Dallas and Fort Worth. However, traffic invariably makes the trips longer. Houston is off to the southeast from Austin. Austin, as a capital city, is second only in size to Phoenix. And its University, the main campus of the University of Texas system, also has one of the largest student populations in the nation. UT is home to the Lyndon Baines Johnson Presidential Library and Museum, and thousands of visitors travel each year to view the letters and documents that mark a pivotal chapter in U.S. history. Visitors can tour the Texas State Capitol, with a dome that rises more than 302 feet into the air, taller than the U.S. capitol in Washington, D.C. But everything’s bigger in Texas, as they say! Austin’s landscape is punctuated with water: in-town lakes, creeks, and fountains, and the flowing Colorado River. Popular subdivisions feature water views and lakeside frontage, and Austin residents savor leisure time and weekend activities in the city’s many parks. 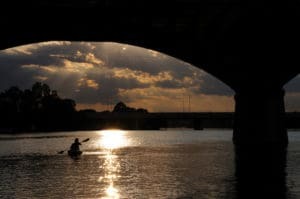 Lady Bird Lake, named for the former first lady, is a beautifully landscaped tribute to the woman who was largely responsible for beautification efforts along state highways and public lands. 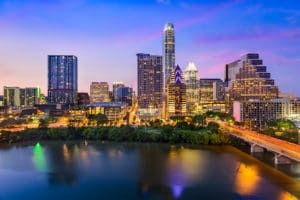 Living in Austin takes many forms — from in-town lofts and modern condos within walking distance of downtown offices to suburban developments that feel more countrified than urban, to farm and ranch land that is still within commuting distance of the capital, the university and the high-tech centers of the city. The range of styles and prices is enormous, but suffice it to say that, whatever you’re looking for, it is probably available. However, be prepared to pay the price! Median home prices hit an all-time high in the spring of 2015, and are still trending up. Austin is known as a center for technology and business, and is a haven for Millennials who throng to the city because of its active music and entertainment scene. Fortune 500 companies in the city include Apple, Google, Cisco, eBay, Intel, Oracle, 3M, Whole Foods, and Texas Instruments. Dell’s world headquarters is in an Austin suburb. But equally well known is the annual interactive film, comedy and music festival known as South by Southwest. Austin City Limits, a long-running PBS concert series, is recorded live at Austin’s Moody Theater, and fans of other musical genres can take their pick of offerings such as the Urban Music Festival, the Old Settler’s Music Festival, Austin Lyric Opera and the Austin Symphony Orchestra. That’s just a brief idea. Willie Nelson also occasionally makes an appearance in Austin. Although he now spends most of his time in Hawaii, he still owns a ranch near the capital. Austin is known as a clean air city and has a long-standing ban against smoking in public places. It is also extremely environmentally active, and there is an emphasis on sustainability, “farm-to-table,” and natural foods, fibers, and practices. There are fine restaurants and funky dives in Austin, as well as numerous farmstands and farmer’s markets. The weather is conducive to an outdoor lifestyle nearly year-round, and residents take advantage of the good weather to work, play and eat out of doors. Food trucks and picnics in the parks are normal for Austinites, second only to rafting, water sports, boating and fishing for leisure time pursuits. Sports, the arts, and culture round out the possibilities for staying active and involved in this city, and Austin residents are just that – active and involved! A motto for the city that residents particularly love is: Keep Austin Weird. In that spirit, the city celebrates Eeyore’s Birthday (from Winnie the Pooh) annually at Pease Park on the last Saturday in April. It is a benefit for local non-profit organizations, and it is not unusual for attendees to wear appropriate, if silly, costumes. But it’s all for a good cause! Alfredo was terrfic! He was prompt, efficient and did a great job! We definitely would use Action Doors again because of him! Knowledgeable, fast, nice guy, on time. Quick scheduling, excellent service, and professional!!! Price quote was good but failed to mention extra trip charge. 1st tech very odd - banged on back door, put 1 spring up on an originally 2 spring system and didn't mention that he was short a spring till he was about to leave and expressed an attitude/frustration with me - not cool! Had 2nd tech - Gerald come out next day and he was friendly, professional and fixed properly in no time. He came to the front door and introduced himself properly so knew we were off to a good start from 1st interaction. The company will make it right, but what they need to do is make sure all of their techs are as well trained in customer service as Gerald. Gerald Dugger was timely, communicative and did a great job. Showed up on time. Had just the unit I wanted. Installation went smoothly. Works great! Find one of our garage door specialist near you by clicking on a city in the list below. Action’s Austin garage door service also offers all types of garage door openers and repairs for homes, condominiums, apartments, commercial buildings, and stand-alone garages. There is no limit to what we can do for you. To learn more about our garage door services, contact us online or call directly at 512-447-3667.